The Battle of Bou Arada was a bloody affair in which the 2nd Battalion, London Irish distinguished themselves, but with grievous losses. The night of 19th January 1943 had been spent just outside El Aroussa, and the next night the battalion moved into the plains to the west of Bou Arada. Another move was ordered, but no sooner had the battalion finished digging that they had to move once more. In fact the London Irish moved four times in four nights, and everyone became tired. On the morning of the 19th, they marched in extended line across the open plain via Bou Arada. Their job was to guard the brigade’s one line of communication, the lateral road from Bou Arada to Grandstand Ridge. The enemy had been quick to see this weakness in the brigade’s disposition, and they occupied a hill, Point 286, only one thousand yards from the road. From there, they could observe, mortar and machine gun the brigade’s life line. It was an unpleasant situation and the London Irish were ordered to remedy it by driving the Germans off the hill and prevent its reoccupation. Instructions came at midnight and there was no time for a reconnaissance beforehand. The plan was for the battalion to form up on the lateral road at about 0330 hours on the 20th. 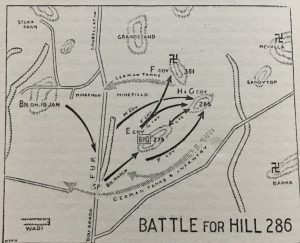 ‘G’ Company were to lead and occupy Point 279, a lesser hill adjacent to Point 286, and ‘F’ Company were to follow and establish themselves on the reverse slopes of Point 279, while ‘H’ Company were to make a detour on the left and attack Point 286 from that flank. Support from the gunners, mortars, machine guns, and anti-tank guns was arranged, though the attack was to be made without any preliminary bombardment as it was though that the hill was not held in strength by the enemy, who would thus not be warned of the impending attack and send up reinforcements. NIGHT ATTACK ON PT 286. At 0440 hours, ‘G’ Company advanced on to Point 279 and, meeting no opposition, continued towards Point 286. ‘F’ Company moved on as well, but started to attack Point 351 to the left instead of Point 286. Here the Germans were strongly entrenched, and 10 and 12 Platoons were held up, while 9 Platoon managed to get forward and took six prisoners, although they themselves were forced later to withdraw. Major BA Tebbitt, commanding ‘G’ Company, realised, as he led his men up the slopes of Point 286, that he had over-shot his objective, and he returned to Point 279. It was now 0730 hours, and daylight. ‘F’ Company also returned to Point 279, where they re-formed to attack their proper target. They moved towards Point 286 round the back of Point 279, with the object this time of attacking the hill from the right. There was a hail of machine-gun and rifle fire as the company approached Point 286. The two leading platoons went forward, covered by ‘G’ Company firing from the forward slopes of Point 279. The enemy were seen running from Point 286, and F Company went in at the point of the bayonet. No sooner had they reached the summit of the hill and found that the enemy infantry had abandoned it, than German tanks and armoured cars were seen ascending the eastern slopes in a counter-attack. German mortars bombarded the hill, but the men of ‘F’ Company stood firm and the enemy cars and tanks were held off. Continued enemy fire took its toll and the gallant company suffered heavy losses, including Captain Ekin, their commander, and Lieutenant Vic Pottinger, both of whom were killed. Lieutenant A Cowdy was left in charge of the company, which was so reduced in strength that they were withdrawn. ‘E’ Company were warned to take over the positions on Point 286, and while the company “O” group were receiving orders, a mortar bomb dropped in one of the trenches, fatally wounding Captain JP Carrigan and two signallers. The enemy by this time had occupied Point 286, and a further effort to drive them off had to be made. Led by Captain JV Lillie-Costello, ‘E’ Company bravely stormed the slopes. Some managed to reach the crest, but others were forced down to folds in the ground to gain cover from cunningly laid automatic and mortar fire. Lieutenant Josephs and his platoon held on, but the officer and most of his men were wounded. Several were killed. The Germans had given up some ground but they had not been driven off the hill. They bombarded the forward slopes of Point 279 where ‘G’ Company were in the open, valiantly trying to help their comrades with supporting fire. Their losses impelled ‘G’ Company back to cover in a wadi behind the hill, where they were joined by the staff of battalion headquarters, and the men of E Company who had survived the attack. The Commanding Officer reported the situation to brigade, but the Brigadier emphasised the importance of securing Point 286, and a further attack by the London Irish was decided upon. The attack was made by ‘H’ Company, and no sooner had it got into its stride than the battalion area was dive-bombed by Stukas, and simultaneously ‘H’ Company were heavily mortared. Their Commander, Major JD Lofting, was wounded, and their Second-in-Command, Captain H Henderson, was killed. Men were falling fast, and the Commanding Officer ordered the company back. Some had managed once more to gain the summit, but it was impossible to hold it in the intense enemy fire. Then word came that the Germans had been seen withdrawing yet again from Point 286. Major WD Swiney, Second-in-Command of the battalion, went forward with all that remained of ‘H’ Company. They went up as unobtrusively as possible, a section at a time, and despite continuous mortaring, they occupied the hill-top. They remained there for the rest of the day, gaining such cover as they could on the bald, rocky hill, where the ground was so hard that they could not dig in. Firing died down in the afternoon and desultory shelling and mortar fire was the only sign of enemy activity to break the uneasy silence of the battle-field. The London Irish had gained their objective, but at a crippling cost. Nearly all the officers had been killed or wounded. ’F’ Company had no officers left, and losses in non-commissioned officers and men had been extremely high. That night the battalion medical officer, Captain LJ Samuels, who had done great work during the day, organised the cooking for the men. Food was prepared in a small culvert under the Goubellat – Bou Arada road, and sent up to the companies. Men of ‘E’ and ‘F’ Companies were on Point 279, ‘H’ were on Point 286, and the rest in the wadi below Point 279. Shortly after midnight, a runner came in from ‘E’ Company and reported that German tanks were climbing the slopes of Point 279, with infantry in the rear. The Germans overran the posts on Point 279 and fired for all they were worth into the wadi where battalion headquarters were quartered. In the darkness all communications within the battalion were disrupted. The companies were scattered and the fighting became very confused – the Germans seemed to fire wildly in all directions, and kept up a demonic yelling as if to bolster up their own courage. They withdrew as suddenly as they appeared, and the tanks moved smartly after them. At daylight the position was once more normal. The London Irish were on Point 286, and the enemy had gone. Final casualties in the Battle of Hill 286 were: 6 officers and 20 other ranks killed; 8 officers and 78 other ranks wounded; 6 officers and 130 other ranks missing. Many of the latter were confirmed later as having been wounded and taken prisoner. The Divisional Commander and Brigadier Nelson Russell visited the battalion after the battle and thanked them for the part they had played in a vital operation. BRIGADIER RUSSELL COMMENDS THE LONDON IRISH. “We had to move over from one side of the road to the other side. As we moved across the road, we got shelled and we dropped into a wadi. I was leading my section along the wadi when suddenly a voice said ‘run’. I just said to the men ‘come on’. We ran down the wadi, got round a corner and I heard a shell explode behind. Going back, I found three men wounded, lying in the wadi, and I patched them up the best I could and waited until the stretchers came. Our platoon commander (2nd Lieutenant) Hardwick was one of the wounded. Then I continued to the forming up point ready for the attack. We holed up in a large depression in the ground, being shelled constantly. The Royal Artillery Forward Observation Officer ordered me to go up to the top of the hill to identify from where the shells were coming. I could see they were coming from a farmhouse about half way down on the plain behind the hill. Read more about Hill 286 here.